After the evening meal, it was back to the barn for the evening session. This was chaired by Simon Catling, who had been behind the Charney book. We were going to have the official launch of the book the following evening, so it was just a mention and a thanks. I have a chapter in this book, and very pleased to have been involved with the project. The after dinner talk was being given by Professor Danny Dorling, who is the Halford Mackinder Professor of Geography at Oxford University. 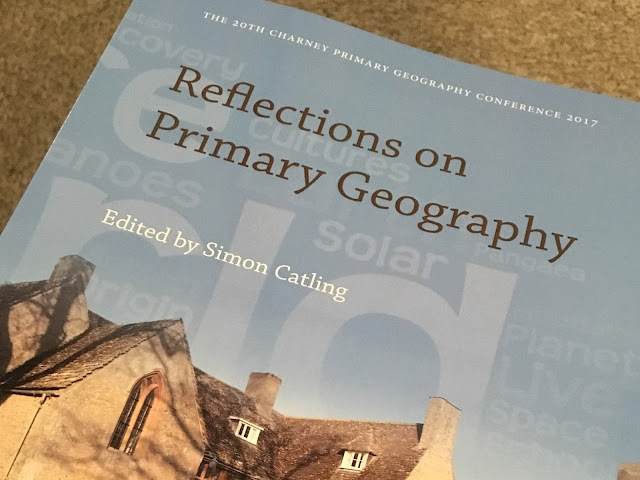 Halford Mackinder was one of the founders of the Geographical Association, so this was an important and significant role, and great that he was speaking at the conference. He was joined by Dr Mary Wells, who is a Primary educator. Danny and I had met quite a few times previously, while working on the LondonMapper project along with Ben Hennig, and at a previous GTE conference. He was talking about a new project which he has just started to think about, which connected with Primary geography. It was interesting to see the early thinking from Danny and Mary, and I will try to suggest some ideas as the project develops. It was a good way to end the first day of the Conference, and Danny and I chatted before I headed for the pub... where I had the chance to talk to quite a few colleagues, before walking back in the dark to Charney Manor.